August is here! As the weather heats up, be sure to continue with your workouts – set new goals to carry into the fall! 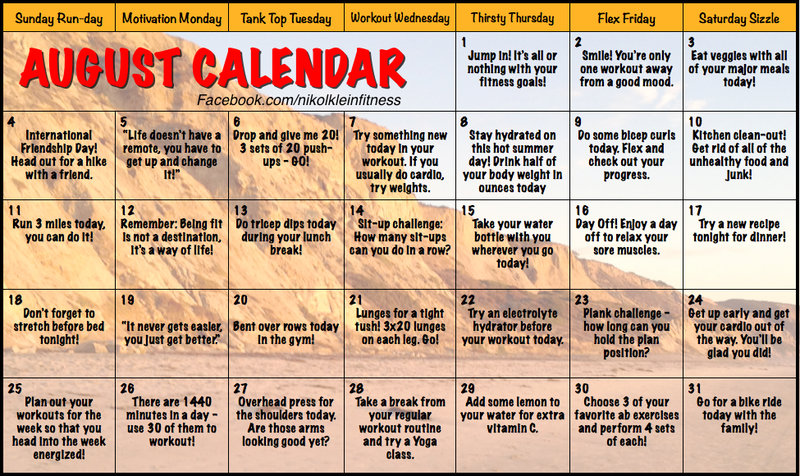 Your motivational workout calendar is below to get you through the days with positive thoughts and exercises. Just click and print! Don’t forget to stop by my Facebook Fitness page for more inspiration, photos, recipes, and videos! After a long, intense Personal Training session it is essential to stretch out your muscles. Often with my training clients I will stretch them out after the session using some of the techniques I learned as a Ballet Dancer. I always tell my clients that the worst thing you can do on a day where you are very sore from training is to do nothing. I always recommend that my clients do a minimum of a 30 minute leg spin out on a recumbant bike and stretch. Here are a few basic stretches that you can do on our own at home if you are not fortunate enough to have a trainer. On a yoga mat or floor, start sitting on your heels, shins and feet on the ground. Open your knees so that they are slightly wider than your hips. Shift the weight of your upper body back onto your heels, and lay down on the ground. Arms stretched out in front of you, head resting on the ground. Relax in this position for 1 minute. You should practice this exercise with absoultely no tension anywhere in the body. This exercise stretch and relax the back while also releasing tension from the hip flexors. Start sitting on a mat or the floor. Stretch the right leg out to your side, while the left leg is bent in towards you. Slowly stretch the left arm up over your head, and reach over towards the right leg. You will feel a stretch in the side, the hip, and the inner thigh of the leg that is extended out to the side. You will also feel this stretch in the hamstring. Hold this stretch for 20 seconds. Repeat to the other side. There you have it. Two simple stretches that you can do on your own in the comfort of your own home! For more information on how you can learn wonderful stretching exercises visit nikolklein.com. Bored with your salad? If you want your weight loss goals to be a success, you have to eat your greens. Lettuce and the other raw vegetables in your salad contain important nutrients. Romaine lettuce, for example, contains Vitamin C, Vitamin A, and is an excellent source of dietary fiber. I often recommend a salad a day to my nutrition clients. So how do you make a boring salad taste good? There are many flavorful natural ingredients that you can add to a salad without adding too much fat or calories. Of course, a variety of salad dressings is a good start. I recommend keeping a few different salad dressings in the fridge so that you don’t get tired of the same one. This way, if you don’t have a lot of ingredients on tap to throw into the salad, you can still enjoy a different flavor. Here are a few healthy salad ideas for you to try! Southwestern Chicken Salad: On top of those greens add chipotle grilled chicken breast, corn, chopped tomatoes, black beans, shredded cheddar cheese, and a low fat ranch dressing. Chinese Chicken Salad: On top of iceburg lettace and shredded cabbage add grilled chicken breast, mandarin oranges, sugar snap peas, carrots, and peanuts topped with a lowfat peanut vinagrette dressing. Grape and Feta Salad: On romaine lettuce add sliced grapes, slivered almonds, red onion, and feta cheese. Use a simple balsamic vinagrette for dressing. Have fun trying these simple salad recipes! You can always substitute salmon, shrimp, or steak for grilled chicken. Enjoy. I see all types of clients and have carefully observed and recorded the patterns of the clients who are getting results. Just because you have invested in a Personal Trainer doesn’t mean you are getting the most bang for your buck. Here are some weight loss trends that I have seen over the past year with my clients. The clients who are seeing the best results are those who are training 3-4 times per week with me. Of course, this sounds a bit obvious and you’re probably saying to yourself, “I can’t afford it.” The truth is that in the long run, these clients are actually spending less money. Not only are their sessions discounted heavily with the more they purchase in advance, but they are seeing results faster. Fitness becomes part of their lifestyle, they crave it. This means that they can break off on their own a lot sooner. The other factor that is effecting weight loss is In-Home training versus training at my home gym. My In-Home Personal Training clients have lost more weight, combined inches and body fat than the clients who come to my home. This is another reason why In-Home training is just so convenient! There are no excuses, no cancellations, and the comfort level aids in weight loss. I have found that cancellations are a big factor with the clients who train with me at my home. I highly recommend having a trainer come to your home to train you! Here are the average statistics from 3 clients who train with me in their homes and 3 clients who train or trained at my home gym. All 10 of these clients are of relative age, weight and fitness level. Measurements consist of Hips, Waist, Calf, Bicep, and Thigh. Time period of 3 months. Total Weight Lost: 62 lbs. What does this all mean, you ask? Sure, there are obvious genetic factors that can effect ones weight loss, but these differences are alarming. In-Home Personal Training is clearly more effective! To invest in your health through In-Home Personal training visit www.nikolklein.com. Every day I am in contact with Women who are unhappy with their current physical appearance. They come to me for my expert weight loss advice, and of course I do everything within my power to share my knowledge with them through healthy lifestyle examples. These include nutrition plans, daily workout routines, cardio workouts, and email support in addition to one-on-one Personal Training sessions, most of which are conducted in their homes. The frustrating part is that despite all of the help and guidance I provide, there are some who still fail to achieve the goals they set out to accomplish when we first met. The following is a list of common mistakes and ways to prevent them from happening. You wouldn’t want to sabotage a weight loss plan you just spent hard earned money on! Mistake #1: You get out of it what you put in– I know this sounds very cliche, but it is true. If you are not waking up 100% committed to the program your trainer has you on, you will not be successful in achieving your weight loss goals. Some think that just working out with their trainer three times a week is enough…it’s not. The clients who get results are those who are putting in extra work. This sometimes means working out twice a day! It truly comes down to how bad you want it. Mistake #2: Not following Meal Plans- Following the Diet/ Meal Plan that your trainer designs for you is crucial to your weight loss. In fact, it’s even more important than the workouts. Meal Plans take your Trainer or Nutritionist hours to design. This is why they are so costly. A common mistake that clients make is thinking that if they workout, they don’t have to diet. Put the Krispy Kreme’s away…you are what you eat. Mistake #3: Canceling Sessions- You’re not hiding from anyone but yourself. I’ve heard every excuse in the book from “I have to stay late at work” to “I’m hungover,” which is by far the worst thing you could ever say to your trainer. Do yourself a favor and don’t even think of canceling, and if you absolutely must cancel, give advance notice. Remember, everyone involved in Health charges for less than 24 hour notice…this includes Personal Trainer and Nutritionists! Mistake #4: Not Doing Cardio- In addition to strength training with a trainer 3 times per week, you should also be performing a cardiovascular activity for at least 30 minutes per day. This is essential to any weight loss program. Mistake #5: Not keeping a Journal- To most of my clients, I suggest that they use a journal to write down everything they eat…every day. Successful clients are bringing these journals to their workout sessions for me to review and critique. These are the clients who are making changes to their diets and feeling confident in their new healthy choices. I hope that you are able to identify some of these mistakes within yourself and correct them for a successful weight loss program! Stay committed to the program you have bought into and you will reach your goals!